I wanted to create a film that would bring back the childhood in all of us; those kind, wonderful years that are buried in all of our hearts. How soon they pass, how quickly we lose the innocence of those years. I had the incredible opportunity to actually re experience mine . . . and from that experience came Colorblind, a story of childhood regained. Our lives are filled with many chapters; people and places. Some live in our hearts more than others. Sometimes inexplicably the right combination of personalities comes along that makes a period of our lives “magical”; a special period we’ll never be able to duplicate again. And sometimes, one person in our lives can touch our hearts and minds so profoundly that we, ourselves, may not even realize how much that individual helped to shape us and make us who we are today. Unless one day something special happens that makes it abundantly clear. Such is the story of my unique grade school class from Cerveny Elementary School in Detroit, and our beloved teacher “Mr. Bell”. In my quest to overcome the tragedies that hit many of us in mid-life (sometimes even sooner), I decided to fill my life with those whom I loved and those who loved me. So, late one night, I began my search for a couple of my special classmates I could never quite get off my mind. What I found was beyond my wildest dreams! Suddenly I didn’t feel so alone anymore. In fact, I felt “at home” for the first time in many decades. With the help of my third-grade boyfriend “Timmy”, we found almost every member of our close-knit grade school class from the 1960s. Turbulent times and the 1967 Detroit riots had robbed us prematurely of our childhoods, but more -- they had robbed us of each other. I began thinking of how many others there were across America who had similar experiences during those same times. Amazingly, we found Mr. Bell (now in his late 60s) but even more amazing, for some reason our dear Mr. Bell remembered each and every member of our special grade school class. He even remembered what we told him we wanted to be when we grew up! As an adult I realized what my classmates and I couldn’t have seen as children: our dreams were as special to him as they were to us. 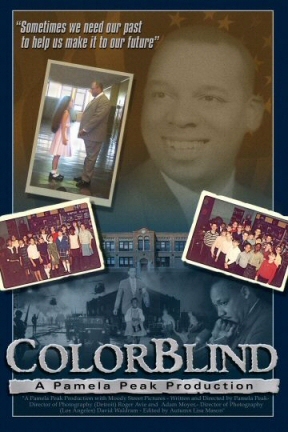 Colorblind is a tribute to our beloved “Mr. Bell”; a giant of a man who taught us one of life’s most important lessons, one that lives on through us and our children. May Colorblind serve as a tribute to those teachers, and those individuals, who touch children’s lives daily in ways that are helping to ensure a better tomorrow. May Colorblind revive our “childhood hearts” and remind us all of the valuable truth we felt as kids: that we are all a part of one human family.